Warning: This article is out of date and no longer works. Please read the updated Discourse article instead. Discourse is an open source discussion platform built for the next decade of the Internet. We'll walk through all of the steps required to get Discourse running on your DigitalOcean Droplet. Ubuntu 14.04 Droplet (64 bit) with a minimum of 2 GB of RAM. If you need help with this part, this tutorial will get you started. Discourse recommends 1 GB of RAM for small communities and 2 GB of RAM for larger communities. It also requires a swap file if you are using 1 GB of RAM. Although swap is generally recommended for systems utilizing traditional spinning hard drives, using swap with SSDs can cause issues with hardware degradation over time. Due to this consideration, we do not recommend enabling swap on DigitalOcean or any other provider that utilizes SSD storage. Doing so can impact the reliability of the underlying hardware for you and your neighbors. Hence, we recommend a minimum of 2 GB of RAM to run Discourse on a DigitalOcean Droplet. Refer to How To Add Swap on Ubuntu 14.04 for details on using swap. You can use an IP address as your domain for testing, but for a production server, you should have a domain that resolves to your Droplet. This tutorial can help. Free account on Mandrill and get SMTP credentials. It wouldn't hurt to test the validity of these credentials beforehand, although you can use them for the first time with Discourse. All the commands in this tutorial should be run as a non-root user. If root access is required for the command, it will be preceded by sudo. Initial Server Setup with Ubuntu 14.04 explains how to add users and give them sudo access. In this section we will install Git to download the Discourse source files. Git is an open source distributed version control and source code management system. In this section we will install Docker so that Discourse will have an isolated environment in which to run. Docker is an open source project that can pack, ship, and run any application in a lightweight container. For more introductory information about Docker, please see this tutorial. In this section we will download Discourse. In this section we will configure your initial Discourse settings. The configuration file will open in the nano text editor. ## TODO: How many concurrent web requests are supported? Choose the email address that you want to use for the Discourse admin account. It can be totally unrelated to your Discourse domain and can be any email address you find convenient. Set this email address in the DISCOURSE_DEVELOPER_EMAILS line. This email address will be made the Discourse admin by default, once a user registers with that email. You'll need this email address later when you set up Discourse from its web control panel. Replace me@example.com with your email. Developer Email setup is required for creating and activating your initial administrator account. Set DISCOURSE_HOSTNAME to discourse.example.com. This means you want your Discourse forum to be available at http://discourse.example.com/. You can use an IP address here instead if you don't have a domain pointing to your server yet. Only one domain (or IP) can be listed here. Replace discourse.example.com with your domain. A hostname is required to access your Discourse instance from the web. We recommend Mandrill for your SMTP mail server. Get your SMTP credentials from Mandrill. The SMTP settings are required to send mail from your Discourse instance; for example, to send registration emails, password reset emails, reply notifications, etc. Having trouble setting up mail credentials? See the Discourse Email Troubleshooting guide. Setting up mail credentials is required, or else you will not be able to bootstrap your Discourse instance. The credentials must be correct, or else you will not be able to register users (including the admin user) for the forum. Also in the env section of the configuration file, set db_shared_buffers to 128MB and UNICORN_WORKERS to 2 so you have more memory room. Tuning these memory settings will optimize Discourse performance on a 1 GB Droplet. NOTE: The above changes are mandatory and should not be skipped, or else you will have a broken Discourse forum. Save the app.yml file, and exit the text editor. In this section we will bootstrap Discourse. Note: If you don't change Docker's DNS settings before running the bootstrap command, you may get an error like "fatal: unable to access 'https://github.com/SamSaffron/pups.git/': Could not resolve host: github.com". Congratulations! You now have your very own Discourse instance! Visit the domain or IP address (that you set for the Discourse hostname previously) in your web browser to view the default Discourse web page. If you receive a 502 Bad Gateway error, try waiting a minute or two and then refreshing so Discourse can finish starting. 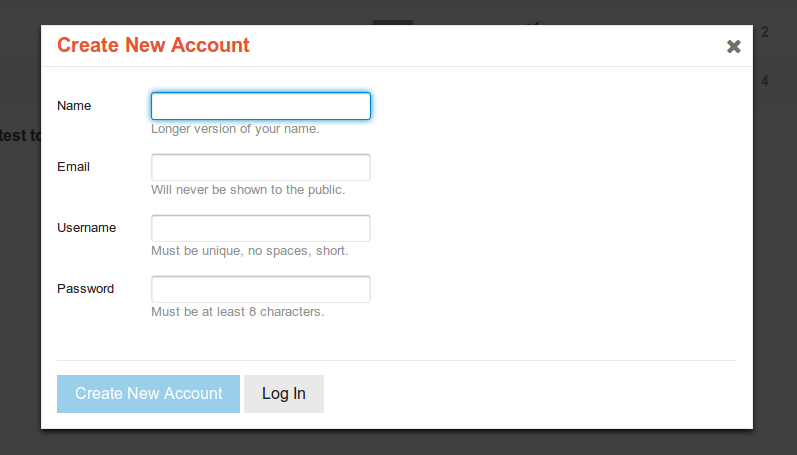 Use the Sign Up button at the top right of the page to register a new Discourse account. You should use the email address you provided in the DISCOURSE_DEVELOPER_EMAILS setting previously. Once you confirm your account, that account will automatically be granted admin privileges. Once you sign up and log in, you should see the Staff topics and the Admin Quick Start Guide. It contains the next steps for further configuring and customizing your Discourse installation. You can access the admin dashboard by visting /admin. If you don't get any email from signing up, and are unable to register a new admin account, please see the Discourse email troubleshooting checklist. If you are still unable to register a new admin account via email, see the Create Admin Account from Console walkthrough, but please note that you will have a broken site until you get normal SMTP email working. That's it! 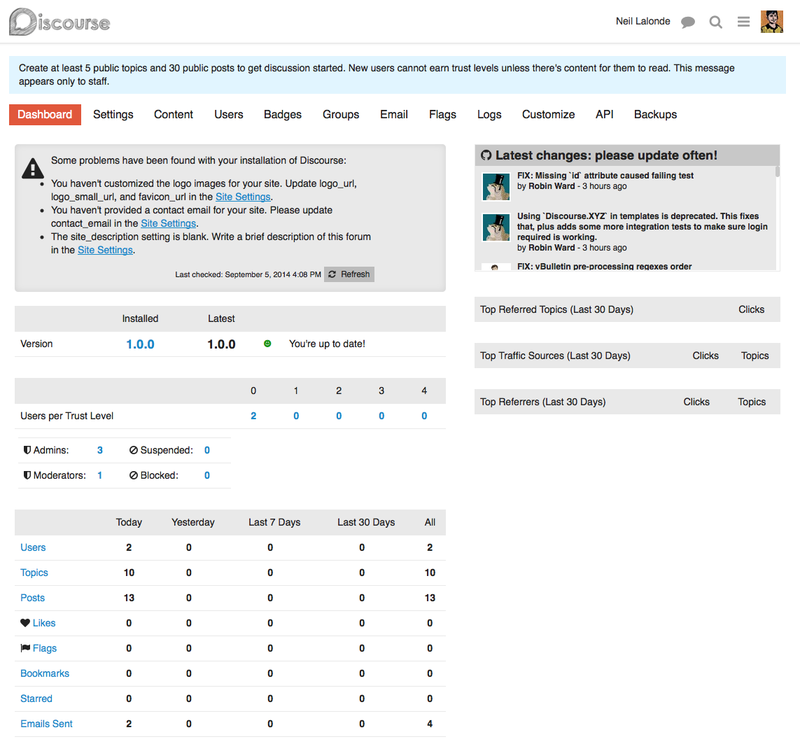 You can now let users sign up and start managing your Discourse forum. To upgrade Discourse to the latest version, visit /admin/upgrade and follow the instructions.